The former President of Mexico on how Illegal drugs have become one of the planet’s most pressing problems. Ernesto Zedillo, introduces an eBook he edited on the issue that points very strongly in the direction of a serious reconsideration of drug policy. America’s most loved economics textbook (Mankiw 2012) uses the ‘war on drugs’ to illustrate how restricting supply when demand is inelastic increases the total cash spent on illegal drugs. Every anti-smuggling tactic makes each consignment more profitable. No wonder the US war on drugs is not going so well. Yet despite 40 years of violence, corruption and continuing addiction, the US is in no mood to alter course. The US is the world’s largest consumer of illegal drugs. It makes up just 5% of the global population, yet according to most estimates accounts for over 25% of global demand for illicit drugs. At the same time, Mexico is the US’s largest supplier, and an increasingly significant supplier of drugs to many European countries. Moreover, in recent years Mexico has been hit by an unprecedented epidemic of violence stemming from organised crime that is leading to ominous comparisons with Colombia. Drug policy in the US has remained essentially unchanged for over 40 years – ever since US President Richard Nixon announced a “national war on drugs” in the late 1960s.2 The persistence of a ‘law enforcement approach’ is remarkable, especially when we consider that experts doubted its validity even before it was fully enacted. In fact, in March 1972 a National Commission on Marijuana and Drug Abuse established by Nixon himself issued its report contradicting the essence of the official policy. Indeed, the Commission recommended that marijuana use should be decriminalised. This recommendation apparently “so angered President Nixon that he refused to receive the report publicly, in spite of the fact that the chair of the commission was a Republican governor, Raymond P Shafer” (for a discussion see Musto and Korsmeyer 2002). And just as the policy stance has persisted, so have the criticisms. Yet this should not be taken to suggest that drug policy in the US and other countries has totally lacked a rational foundation all along. The debate is really over the weight that medical and public health concerns – not to mention basic human rights or even economic rights – should receive in the formulation of policy. For whatever reason – and many would point to political necessity – the goal of reducing crime and condemning ‘disruptive behaviour’ has dominated the rationale behind drug policies, leaving little space for health strategies and paying little attention to the knock-on effects. Of course, the architects and subsequent followers of the ‘war on drugs’ strategy believe that they were acting on behalf of the public interest, but that is hardly a reason not to examine the basis for, and the results of, their policies. Will Mexico repeat Colombia’s misery? Contributing to the sense of urgency in this debate is the high cost already paid by Mexico. 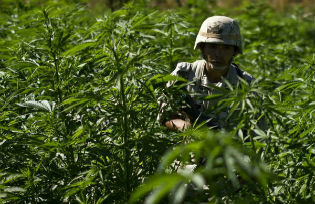 The violence caused by organised crime in the Mexican drug trade has approached Colombian proportions in recent years. Political scientist Eduardo Guerrero Gutiérrez (2012) estimates that between end-2006 and end-2012, the number of deaths related to the activities of organised crime will reach 64,000 in Mexico. There can be little doubt that if Central America is bound to become the next key battleground for the “war on drugs”, it will be nothing short of devastating. Joaquín Villalobos (2012) argues that if the trend continues Central America could see its economies and political systems crumble under the pressure, returning the countries to the instability of the cold war years. What to do about US demand? Although all agree that demand from the US is a chief cause of the troubles in Mexico and Central America, there are differences in how to address this. Jonathan Caulkins is not only sceptical of the political feasibility of legalisation of illegal drugs, for example, but also argues that this position should be sustained (Caulkins and Lee 2012). Caulkins is convinced that prohibition drives prices up far above legal levels; that the taxes necessary to prevent a price collapse, if drugs were legalised, are uncollectable. Moreover, he is not alone in seeing legalisation as an “irreversible game” in that some drug use induced by legalisation would remain even if that policy change were later undone. Other authors argue that political support for the status quo remains strong. For example, Keith Humphreys, a former senior advisor at the White House Office of National Drug Control Policy in the Obama administration, places at zero the probability of seeing a radical change in the policy towards cocaine any time soon, the drug whose US market provides at least half of the Mexican drug gangs’ total revenue. Part of the reason for this is that present policies, for all their flaws, have coincided with a relative stabilisation in the overall levels of use in the US (see also Kleiman 2012 and Donohue 2012). Yet despite this, Peter Reuter (2012) shows that there is very little evidence to suggest that enforcement raises prices or reduces availability. Between 1980 and 2005, the number of people imprisoned for drug offences in local jails and state and federal prisons increased by a factor of 10, yet during this period of increased policing, the price of heroin and cocaine fell around 70%. Jeffrey Miron, meanwhile, reiterates the classical economic case for a laissez faire approach. It stems from the uncontested fact that prohibition does not eliminate drug markets, but simply drives them underground and the money into the hands of criminals (Miron 2012). Miron proposes legalisation with a sin tax on drugs sufficiently stiff to yield a price as high as under prohibition. While not endorsing outright legalisation, other authors nevertheless do provide sensible arguments for moving away from the status quo. Without endorsing outright legalisation, other authors nevertheless do provide arguments for moving away from the status quo in a direction that would address the consequences of black markets. After reporting that 56.6% of the estimated cost of illegal drug use in the US (estimated for 2002 as $217 billion in 2008 dollars) was due to crime-related costs and only 8.7% was caused by health costs, Stanford Law Professor John Donohue admits serious concerns about the balance of overall US drug policy. He insists on the fundamental question of how it can be possible to have falling prices of illegal drugs in the face of intense enforcement efforts – carrying an annual cost of more than $40 billion. Interestingly, he invokes an earlier study by Caulkins and others that found that an additional $1 million spent on treatment and demand reduction reduced net cocaine consumption by 103.6 kg while the same amount of money spent on longer sentences reduced consumption by just 12.6 kg. What to do about Mexican supply? On the other side of the market is the supply from Mexico. Mark Kleiman criticises the US government’s long-standing demand that Mexico act to reduce the flow of drugs across the border so that US drug consumption will be reduced. He claims that even if Mexico were successful in crippling that traffic, the effects on drug abuse in the US would be modest at best because shipments of drugs would simply be shifted to other routes. Moreover, somewhat surprisingly, some of those who are sceptical of the possibility or even the convenience of any significant drug-policy changes in the US argue that Mexico should change its strategies and policies to align them more with its own interests and less with those of its northern neighbour. Both Kleiman and Caulkins suggest that the objective of minimising violence should have a higher priority in the Mexican strategy – a suggestion that no doubt would make more than one law enforcer raise an eyebrow. Despite their differences, the arguments and evidence presented in the eBook point very strongly in the direction of a serious reconsideration of drug policy. The economic and human costs paid both in the US as well as in the countries where the drugs come from, cast doubt over the validity of such policies. Our US colleagues who tell us that any significant change in the strategy is unlikely to happen in the US essentially for political reasons may be right. But it doesn’t mean that those concerned about this problem, for good reason, should give up. On the contrary, the resistance to change should encourage more and better research and a bigger effort to foster a rational discussion of the drug problem. Our eBook aims to contribute towards these ends. Babor, Thomas F (2012), “The Public Health Impact of Drug Policies”, in Ernesto Zedillo and Haynie Wheeler (eds. ), Rethinking the “War of Drugs” Through the US-Mexico Prism, Yale Center for the Study of Globalization. Caulkins, Jonathan and Michael Lee (2012), “Legalizing Drugs in the US: A Solution for Mexico’s Problems for Which Mexico Should Not Wait”, in Ernesto Zedillo and Haynie Wheeler (eds. ), Rethinking the “War of Drugs” Through the US-Mexico Prism, Yale Center for the Study of Globalization. Camín, Héctor Aguilar (2012), “On Mexican Violence”, in Ernesto Zedillo and Haynie Wheeler (eds. ), Rethinking the “War of Drugs” Through the US-Mexico Prism, Yale Center for the Study of Globalization. 1 It is impossible in this column to do full justice to the contributions presented at the conference and in the eBook. The concerned reader is advised not only to look at all the papers in the eBook but also at least glance at the transcription of the debates that took place during the conference, which can be found at www.ycsg.yale.edu. 2 In the “Special Message to the Congress on Control of Narcotics and Dangerous Drugs,” (14 July 1969), President Nixon did not use the term “war on drugs” but he clearly and in great detail outlined the policy that would be in effect for the duration of his administration (see here). It was in a press conference in June of 1971 that he first used the term “war on drugs,” declaring drug abuse public enemy number one. Ernesto Zedillo is the Director of the Yale Center for the Study of Globalization and Professor in International Economics and Politics as well as Chairman of the Board of the Global Development Network, an organization that works with developing country researchers and policy research institutes. Previously, he served as President of Mexico from 1994-2000. After earning his PhD at Yale, he was with the Central Bank of Mexico before serving as Undersecretary of Budget, Secretary of Economic Programming and Budget, and Secretary of Education. He was appointed by the World Bank President to chair the High Level Commission on Modernization of World Bank Group Governance, co-chaired the Partnership of the Americas and served on the International Commission on Nuclear Non-proliferation and Disarmament. He currently serves as Vice Chair with Kofi Annan of the Commission on Elections, Democracy and Security, Co-Chair of the Regional Migration Study Group and a member of the Global Commission on Drug Policy. He is a Member of the G30.